Scott Willcox first awoke to jazz when he heard Fats Waller. “The piano playing, not the singing. I’m a pianist, so I loved Art Tatum, too.” Scott doesn’t play piano in the big band he leads, but he does the arranging and writes almost all the material. He doesn’t cite any arrangers as an influence, but rather his classical training — “That’s why I write contrapuntally.” Though he does admit to a liking for the arrangements of Bob Florence. 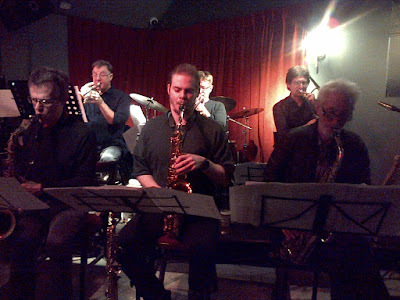 Scott’s big band has been in existence for years, although this smaller (ten-piece) unit is of more recent origin. It consists of some outstanding players and on this winter’s night in Barnes the band was joined by guest vocalist Georgia Mancio singing her own material, written in collaboration with Alan Broadbent. African Dance was a jaunty, exploratory piece presenting unison sax (Chris Biscoe and Sam Eagles on alto, Julian Costello and Steve Main tenor) and developing into a sound somewhat reminiscent of a skilful Mingus traffic jam — with trumpets (Gabriel Garrick and Andy Gibson) and reeds playing car-horn interpolations when they weren’t unfurling the cheering melody. “There are a few shocks in this,” announced Willcox as Where Next began with a repetitive figure on piano by Dave Frankel supported by Ben Hazelton on electric bass and a staccato pattern of rim-shots by Gary Willcox on drums which set the horns on a mysterioso excursion with Martin Gladdish’s trombone rising above the group for a forceful, concise solo. Chris Biscoe played his alto with a plaintive rapture. Steve Main’s purring tenor went low as Andy Gibson’s trumpet went high. Gladdish and Biscoe had some beautiful pairings and the steady, unwavering pulse ticked out by Willcox on the rims propelled the combo as the saxes fell away, playing themes and solos. Steve Main was outstanding and Dave Frankel’s dreamlike piano fashioned the conclusion. The only real shock was finding musicians of this calibre playing complex, original music in a pub in south London on a snowy Wednesday night. The Journey Home was an original written by Georgia Mancio and Alan Broadbent and presented by the singer with just the rhythm section. Mancio’s voice was fresh and vivid, richly delivering the lyrics. For Bud was an opportunity for Ben Hazelton to solo on his bass with singing musicality. On Listen Up, a Willcox composition, Andy Gibson led the brass in, Sam Eagles playing a beguiling figure with sustained concentration. Georgia Mancio’s vocals see-sawed with the sax section, then traded places with muted trumpets. Eagles’ alto was pulsing and brooding, giving way to a glittering wail of a solo by Gabriel Garrick. Mancio’s voice floated lightly through the lines of the ensemble playing, like a bird through evening trees. Slane was an adaptation of an Irish folk song, opening with thrumming bass from Hazelton, skimming cymbals from Willcox and an utterly lovely alto statement from Eagles. This ballad introduction was picked up by Main and Gibson, with adroit support from the others and a beautiful fill by Biscoe. But it was Eagles, playing sad and sweet and gorgeous alto, and Dave Frankel’s piano which made the hair stand up on the back of your neck, abetted by the tight, perpetual ticking of Willcox’s flawless drums. And when the whole combo came in, like friends turning up for a party, we were reminded why the principle of big bands exist. Gabriel Garrick brought the piece to an end — which arrived all too soon. The Water is Wide was another folk song setting, with an aching lyrical intro by the tenor saxes and Andy Gibson on trumpet. Then Biscoe’s alto and Georgia Mancio’s vocals offered a heart-ringing refrain. When Dave Frankel’s piano and Gladdish’s trombone came in, the piece opened like a flower in sunlight. Gibson soloed with great taste and judgement and Frankel played with the lightest of touches. The combination of voice and large instrumental unit was at its most memorable on this evocation of an ancient, simple ballad. Among the many pleasant astonishments of this evening was the revelation that this was the first time Georgia Mancio had sung with these musicians. It’s unlikely to be the last.